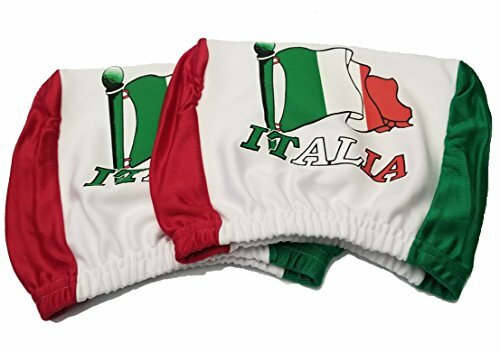 italian Headrest Cover (1 Pair per order) 10"x8.5" or 26x22 cm Stretchable Introducing the itali WI Headrest Covers. A normal seat covers itali logo is often located at lower position to show off your island logo and flag. the front will also be block when sitting on the seat which eliminate that chance for other people or even yourself to view it. When you purchase a seat cover with certain logos you wanted it to be seen easily either by yourself or other people who passed by your vehicle the logo design can be seen from hundred yards away and every time you look over your shoulder. Made by soft polyester . Purchase the deigns desire and place them on your vehicles headrest Need a seat cover to match them? No problem, a base seat cover set made with the same material is also available for the perfect match. Complete set comes with 2 front bucket seat covers and a 2 pieces design rear bench cover. Start to make your collection of these headrest covers for yourself or give them as a gift set and get ready for the unique and personal look on your vehicle that will inspire people with their first sight. If you have any questions about this product by BUNFIRE, contact us by completing and submitting the form below. If you are looking for a specif part number, please include it with your message.